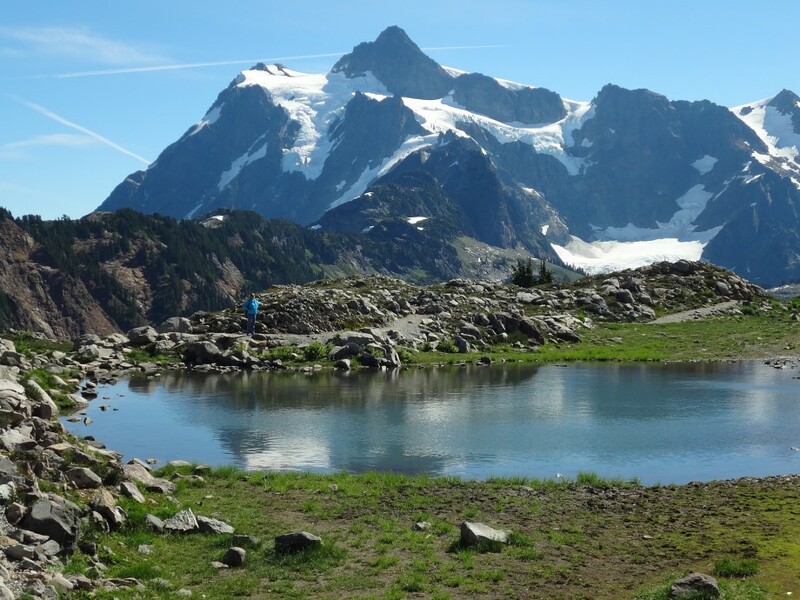 Backpacking, wild camping, wilderness trekking – whatever you call it I mean multi-day hiking and camping trips into the wilderness carrying all the gear, clothes and food you’ll need to survive in a backpack. In the United States, particularly in the western U. S., there are millions of acres of wilderness to explore. This article describes the gear for backpacking in temperate conditions, not winter camping, glacier travel, rock climbing or other activities that require specialized gear and skills beyond those needed for hiking into the wilderness. Backpackers come in all types. Some are ultra-light aficionados, others take all the comforts of home. Me? After four decades of backpacking in California, Oregon, Washington State and Alaska, much of it solo trips, I’ve settled into a routine of packing as light as reasonable without sacrificing a few comforts. If you’re new to backpacking you can start off with inexpensive, mid-range equipment and upgrade later, but in this article I’ve recommended upper end equipment based on my experience with it. The initial outlay for high quality backpacking equipment can be relatively expensive, but good gear lasts for decades and over time backpacking is the cheapest outdoor activity there is. Backpack: There are two basic choices; internal frame or external frame packs. As the name suggests there is an aluminum or carbon fiber frame on which the pack is mounted and this frame can be non-visible (incorporated inside the pack) or visible (the pack is mounted onto a visible frame). Generally, external frame packs are good for trail hiking with easy access to many pockets while internal frame packs are used in rougher, wilder conditions where their sleeker profile passes through brush and rock more easily. For weekend trips of two or three nights a 50 to 60 liter capacity pack is fine. When you start packing in for a week or more you’ll need a 70 to 90 liter pack. A good fit to your body with comfortable shoulder and waist straps is essential and good quality equipment will have adjustments for fit. Today’s backpacks are far lighter than older ones, but beware of thin material, it won’t hold up, so buy a sturdy pack made of ripstop nylon. There are all sorts of extras on today’s backpacks – camelback water bladders, detachable day packs, multiple gear pockets, but I’ve found simpler is better. My backpack is one of my ancient items; a 90-liter, internal frame North Face Snow Leopard that I bought in 1990. At 8-pounds it is heavy but time-tested and weather-proof. You’ll spend $200 – $500 for a good pack. Lowe, Mountain Smith, Deuter, North Face, REI, Gregory all make very good backpacks. All of this goes . . . .
Boots: Don’t go cheap here and there are some outstanding selections available nowadays. The thing to remember is this – Vibram. Nothing has come along in the past thirty years to equal the grip and durability of Vibram soles. For short trips there are light hiking boots or trail shoes (heavy-duty tennis shoes). I wear mid-weight, ankle-height leather boots from REI that give ankle support and protect ankles against rocks, but other good brands include Vasque, Sportiva, Keen, Merrell for $125 to $250. If you’re going in for longer or rougher, off-trail trips – splurge for a heavy hiking boot. At $200 to $350 they’re spendy and heavy, but with full leather uppers and ¾ steel shanks in the soles for stiffness they’ll last for many years and give the support you’ll need to haul a heavy pack for days on end. Asolo, Salomon, Zamberian make high quality, heavy-hiking boots. Shelter: There are tents, bivy sacks, or for some purists, no shelter at all. In my ultra-light phase I packed a bivy sack (bivy short for bivouac – a waterproof tube covering your sleeping bag and head), but nowadays I pack a 3-pound Mountain Hardwear Skyledge one-man tent (roomy enough for two in a pinch). I like self-standing tents as they free you set up anywhere instead of needing ground soft enough for staking down the tent. The North Face, REI, Big Agnes, Mountain Hardwear, MSR, Marmot, Sierra Designs all make excellent backpacking tents. Expect to pay $150 – $350 for a good tent. Sleeping: Three decisions when buying a sleeping bag: fill, shape and temperature rating. Nothing beats goose down for lightweight and warmth, but if it gets wet it’s useless so a synthetic fill bag is worth considering if camping in potentially wet weather. As for shape, many people find the narrow mummy shape too confining (I do) and choose to go with a square, or semi-square cut bag sacrificing a little of the temperature rating of a mummy for the comfort of more leg room. Temperature rating is pretty subjective and you can boost the warmth of your bag by using a nylon sleeping bag liner. I tend to take a warmer bag than the potential weather conditions dictate since you can always unzip it and use it as a comforter if nights are too warm, but it could be cooler than predicted also. And, don’t forget a sleeping pad. I use a Sierra Designs semi-square cut, goose down sleeping bag rated to 20 F that I religiously pack in a waterproof sack. Under the bag I use a ThermaRest, self-inflating sleeping pad. 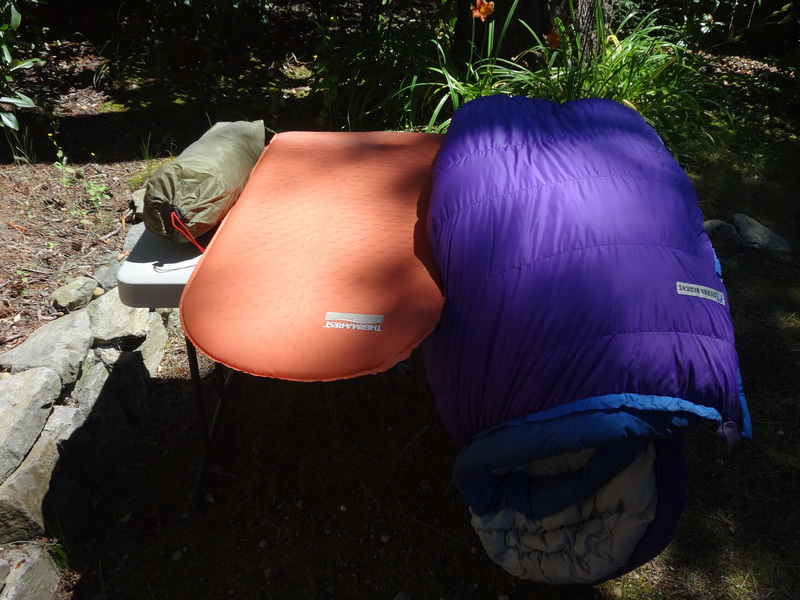 REI, Marmot, Gregory, Sierra Designs, Big Agnes all make excellent sleeping bags. Figure on spending $150 to $400 for a good sleeping bag (down being at the top end of the cost range). Cooking: Ultra-light packers don’t carry a stove and eat cold food instead. Stoves and fuel are heavy and bulky, but I like my hot meals and coffee so I accept the weight. Most wilderness areas require you use a stove for cooking and besides, the romance of cooking over a smoky fire gets old real quick. The good news is there are excellent backpacking stoves nowadays, but consider the fuel. There are backpacking stoves that burn liquid fuel or pressurized canisters of gaseous fuel. Fuels range from propane, butane, alcohol , white gas and multi-fuel stoves that burn a range of distilled petroleum fuels. I’ve found those that burn “white gas” are the best since white gas contains the most BTUs (British Thermal Units) per ounce which means you carry less fuel for more heating. But white gas can be hard to find in some areas or in foreign countries and, . . DON’T EVER substitute unleaded vehicle gasoline for white gas – this is way too dangerous. Stoves that use pressurized canisters of gases are simple, cheap and convenient, suitable for short trips, but they burn much more fuel since the BTU content per ounce is considerably lower than liquid fuels and the canisters, full and empty, are bulky to pack around. My stove is truly ancient, not even made anymore; a Swedish Svea white gas stove (basically a Bunsen burner). MSR pretty much has the market cornered on white gas and multi-fuel stoves with its excellent Whisperlite series. There is a range of inexpensive canister stoves, Primus makes a good one. A word on cookware: There is stainless steel, titanium or aluminum backpacker’s cook kits available from REI , MSR, Outdoor Research. I’ve found that simpler is better and stainless steel is the best for good cooking and durability. My cook set is so old I forget where I got it and consists of two 1-quart aluminum pots that nest together into a tight package. Utensils; just a steel fork and spoon that fit inside the nested pots (I use my Leatherman if I need a knife) and for a cup, a REI plastic French-press coffee mug. Plan on about $35 for a propane canister stove, $100 for a MSR Whisperlite, and $35 for a set of good quality cookware. Food: You can take whatever you want if you’re willing to pack the weight, but regardless, tasty food is important to enjoying the trip. For short, two or three night trips: I’ll tolerate some extra weight for luxuries like canned chile n beans, fresh eggs (shells removed and in a Nalgene bottle), cheddar or Gouda cheese and crackers for lunches maybe even a few strips of bacon (fresh foods like cheese, eggs and bacon will last for a couple days even in hot weather if kept out of direct sunlight). The rest is standard backpacking food I take on any trip like instant oatmeal for breakfast, instant coffee, salt/pepper, dehydrated milk (many uses). Longer trips up to two weeks: Now weight and bulk are serious issues and I shift over to freeze-dried foods for dinners (still taking my instant oatmeal or dehydrated soups for breakfasts). Nowadays there’s lots of inexpensive dehydrated and freeze dried foods in the grocery store (soups, noodles, prepared dinners) but many of those backpacker’s freeze dried meals are tasty so I bring some even though they cost between $8 to $15 per meal. When buying freeze dried meals be careful – I’ve found the fancier the meal, the spicier they are which can lead to an upset stomach, so I stick to noodle-based meals like spaghetti or stroganoff, rice-based meals like chicken and pilaf without overly spicy sauces, and a couple of desserts. I like Starbucks Avia instant coffee, but that’s an expensive luxury. Tea, instant Tang (for a little sweetness), dehydrated butter and milk, salt/pepper and some dehydrated wasabi powder (spices up even the blandest meal), peanut butter in a tube, and some sturdy crackers for lunches (saltines or pilot bread hold up reasonably well). Use your imagination in the grocery store – there’s hermetically sealed pouches of tuna, salmon and beef. There’s rice cakes, jams, dehydrated chiles – all sorts of lightweight foods to create tasty, filling meals. NOTE: Many national parks and some wilderness areas are now requiring you carry and store your food in a “bear vault” (a critter-proof container). No way around it, they’re bulky, but sometimes you have to have it so, when I have to, I use a 7-liter, polycarbonate BearVault, bv 450. At least it can double as a camp stool and for carrying water from stream to camp. Clothes: Typically not too heavy, clothes are where you add bulk to your pack, so pack carefully. I’ve found quick drying, lightweight synthetics, or wool/synthetic blends, are the way to go, although I’ll pack one cotton tee shirt as a luxury. For feet, a pair of mid-weight wool/synthetic blend hiking socks with a lightweight polypropylene inner sock (cuts down on friction and blisters). I pack an extra pair of socks. For pants one pair of synthetic long pants that convert into shorts by zipping the legs off (doubles as swimming suit). A long sleeve, synthetic shirt keeps bugs and sun off your arms and I pack a mid-weight fleece coat (cuts the evening chill and rolled up doubles as a comfortable pillow). Underneath, quick dry synthetic underwear (I pack two pair). This is topped off by a good quality Gortex rain jacket with hood although a vulcanized rain jacket will work. I like to wear a ball cap, sometimes a sombrero if in particularly sunny country, and a pair of cheap, cotton work gloves comes in handy for handling hot cookware, fighting through brush or scrambling over rough, rocky areas. I finish off my clothes packing with a pair of “water socks” (nylon slippers with rubber soles) to give my feet a break from the boots around camp although a pair of sandals are fine too. If cold weather is possible I’ll pack a pair of fleece sweat pants, a fleece headband or watch cap and fleece gloves. Navigation: I guess I’m old school – no GPS for me, simply a Silva compass (with declination setting) and topographic maps. Besides, I would never rely on GPS alone – in addition to technical failure problems (dead battery, etc.) GPS can’t tell you what obstacles there are between point A and point B. First Aid: Often overlooked, a thoughtfully stocked first aid kit is essential. I use a nylon zip bag filled with gauze pads, two sheets of thin moleskin, 30 large size BandAides (can cut them down to size), medical tape, a pair of surgical scissors, good quality tweezers, a compression bandage, aspirin, Ibuprofen, Neosporin and antacid tablets. Safety: This is separate from First Aid as this is preventative gear. First and foremost – sunglasses. I include them here because they’re essential when hiking across snowfields or for hours across open rock in the high country. You can get “snow blind” and stumble or worse, not be able to sleep. Water filter – I rarely use one, but if you have anything like a delicate stomach you’d better carry one especially in areas where livestock is allowed to roam. Get one with a ceramic filter and a generously sized pump handle or you’ll be pumping for hours. I use a MSR ceramic filter pump that screws directly onto my wide-mouth 1-liter water bottle making it easy to use. Bear spray, bells or firearms – I don’t use them. I’ve seen hundreds of bears, some mountain lions, a few wolves and never had a problem plus bear spray or a gun is rarely handy when you need it and they’re dangerous to have around. Bells are just annoying and marginally effective. Cell phone. Not a bad idea, but coverage in the wilderness is often poor and you normally have to climb to a high point to get a signal. General Gear: Water bottle – don’t forget your water bottle – at least a liter of water when hiking. I carry a Leatherman multi-tool that has a knife, pliers and a few basic tools incorporated into it, and I’ve used them all at one time or another. 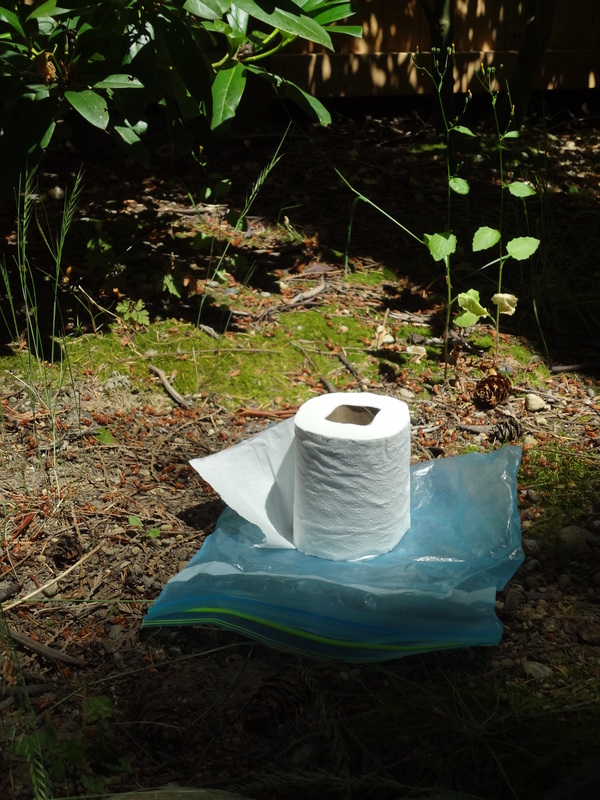 All other general-use items go into a small “possibles sack” (old prospector’s term meaning a bag containing anything you might possibly need). In it is my Petzl LED headlamp, small sewing kit, small bottle DEET bug repellent, mosquito head net (rolls up to nothing), sunscreen, small nylon fabric repair kit for tent and sleeping pad, 50 feet of ¼” braided nylon line (for hanging food and other camp uses), extra boot laces, some duct tape rolled up onto a pencil, toenail clippers, toothpaste and brush and a small washcloth. I carry a small, compact day pack for local hiking however the top compartment of some backpacks detach to use as a daypack. I always carry a bandana, too many uses to list, and, . . . don’t forget the toilet paper! Luxuries: First of all a camera. I use a Sony Cyber-shot, point n shoot compact digital camera – good battery life and excellent photos and videos. Liquor – debatable if this is a luxury or necessity, but I take a pint of good Canadian whiskey. I carry a ThermaRest chair kit that converts the ThermaRest sleeping pad into a comfortable camp chair. Reading material – I don’t carry books anymore, but a good read can be nice when lounging around in camp. Trekking poles – I never used them before and laughed at those that did, but I’ve since found how helpful they are and I’ve become a convert. I carry a pair of REI Traverse trekking poles. So, pack up and head out and as John Muir said, go climb the mountains and get their good tidings.